While diesel has been the conventional fuel of choice for backup generator sets because of its initial capital cost advantages, things are changing as regulations, costs and technologies have evolved, and, because of that evolution, natural gas generators have gained in popularity. 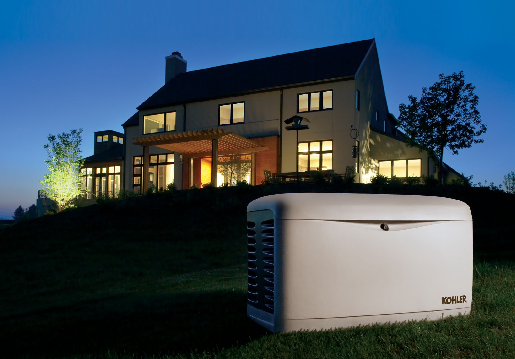 Kohler’s standby commercial generators can run on propane or natural gas. Kohler Co.’s Power Division offers a slew of EPA emissions-certified LP and natural gas generators in the up to 400 kW range, delivering an installation-ready product for residential power and light commercial applications. 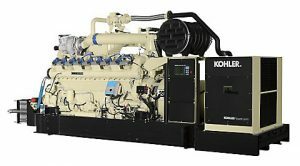 Kohler also developed a new line of large natural gas generators that are designed specifically for standby, prime or continuous power applications in the North American market. The large gas gen sets range from 425 kW to 1300 kW (and growing). For applications that require larger industrial generator sets, contact Steiner’s Power Systems division experts and they can help you choose the most appropriate generator. The 14/20 kW RESA Kohler home generator. These natural gas generators run on relatively clean burning fossil fuels such as propane. The lower emission gaseous gen sets significantly reduce carbon monoxide and particulate emissions. Steiner Electric, a local authorized distributor of Kohler products, offers an extensive inventory of residential and commercial generators that primarily operate in standby-rated mode utilizing LP or NG fuel. The Kohler 38/48/60 kW RCL generator. a multitude of standby ratings for both gas types. The 80 to 150Kw ERESD models have numerous features including the Fast-Response X excitation system, and sophisticated control systems. The Kohler 60 kW ERESB generator. 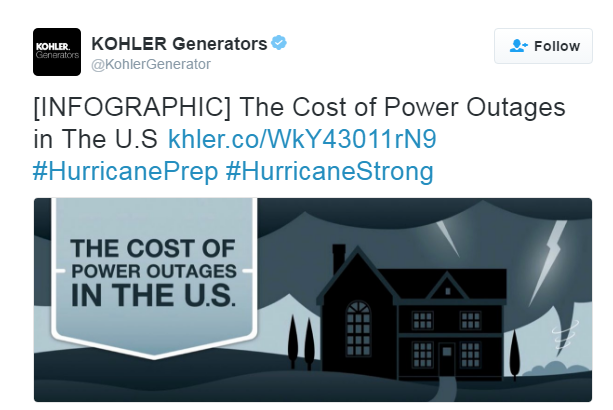 In addition to Steiner’s large inventory of generators, as a registered, certified distributor of Kohler generators, generator experts are available 24 hours a day, 7 days a week for emergency situations. In addition, all Steiner generator experts undergo rigorous training programs that must first be completed and are routinely updated. These models operate differently depending on the fuel used, mixture of air and fuel, applications and other factors. Often, there are tradeoffs such as between power and efficiency. The 80/100/125/150 kW RESD model generator for light commercial applications. performance characteristics found in gas generator sets that utilize different fuels and engines, power factor, generator set rating, load requirements, and more parameters. Fuel sources, for instance, typically come in two categories: methane-based fuels sources and hydrocarbon-based fuel sources. As Hardenburger explains, methane-based fuels such as pipeline natural gas are for use in high-compression ratio, lean-burn engines. Hydrocarbon-based fuel sources such as propane can be used in low-compression ratio, rich burn engines. Hardenburger says that gas engines are classified as either lean-burn or rich-burn combustion types. Each type has its own advantages and disadvantages depending upon the application. Lean-burn engines are associated with high-electrical efficiencies, and are typically used in continuous parallel with the utility applications as a primary power source because of limited transient response capabilities. Whereas rich-burn engines are usually associated with applications where transient load response is more critical than fuel efficiency. They are typically applied in emergency standby applications where the generator set system is the secondary power source when utility power is not available. Rich-burn engines are a better choice in applications where large transient load changes above 30% are required. An LPG fuel source can be utilized in these applications without derate if low compression ratio engines are utilized. Kohler offers natural gas generators at up to 1300 kW. For more information about your application, contact your Steiner Power Systems application engineer at (847) 956-3098. Lean-burn engines are a better choice in applications where the utility is always present, and the required operational capacity exceeds 8,000 hours per year. Fuel efficiency is a key consideration in continuous applications, so engines with high compression ratios are typically utilized. 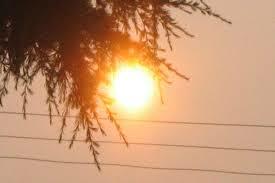 Heavy hydrocarbon fuels such as LPG cannot be utilized in these applications without significant engine derate. To help understand the basics of gas generator characteristics, their benefits and tradeoffs, download the Kohler whitepaper, Gas Generator Set Performance Characteristics, or reach out to your local Steiner Power Systems application engineer at 1-800-STEINER (783-4637). June 30th is Social Media Day. In honor of the special occasion we will reflect on some interesting and successful social campaigns being implemented across popular social channels by three different brands. The following campaigns provide great examples of effective uses of social media (Facebook, LinkedIn, Twitter and YouTube) any company can beneficially emulate to drive customer engagement. 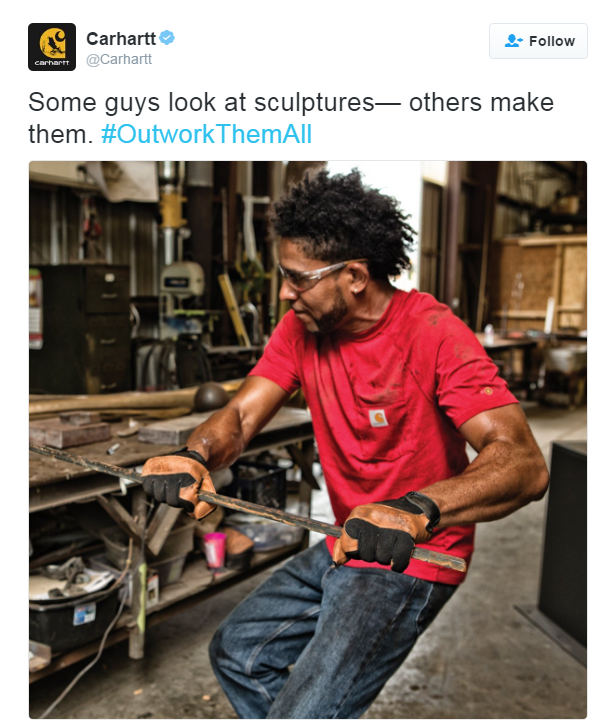 Carhartt has campaigns across Facebook and Twitter that allow interactivity for fans and followers – for example, hashtag contests like #OutWorkThemAll encourage users to share photos of themselves working on tough projects while wearing Carhartt gear. Carhartt engineers consistency across Twitter and Facebook, with many similar campaign attributes being utilized in both networks. Hashtag campaigns like #OutWorkThemAll thrive cross-network, sharing photos of customers and products, providing Carhartt with a cost-effective grassroots promotional product campaign. Carhartt also actively posts several videos and playlists on YouTube – one of which is the helpful “Do-It-Yourself” series of videos. These instructional videos provide customers with an easy guide of how to use products or how to complete tasks. They help answer customers’ questions giving Carhartt a practical extension to their customer service operations. Kohler too promotes their individual campaigns across multiple social media networks. For instance, the #HurricaneStrong campaign is run across Twitter and Facebook. This hashtag campaign is dedicated to preparing for power outages caused by Hurricane storms. 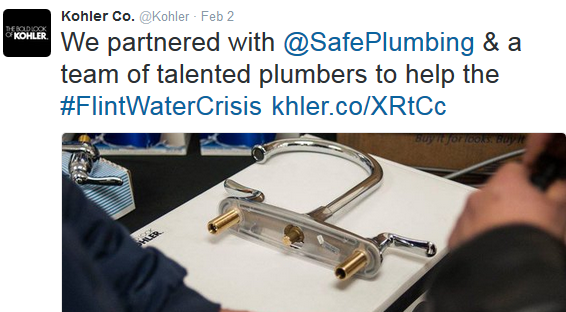 Kohler also tweets about timely events, tying into their brand. For instance, how they partnered with another company to help with the Flint Water Crisis. An organization or brand that posts content in relation to current events allows followers on social media to see real-world examples of how brands can affect or have a positive impact in responding to a current crisis. Kohler additionally provides up-to-date information on details from trade shows and other events that they attend. This allows users to find an event they may be interested in attending to learn more about industry-related topics pertinent to their business. Kohler further has an active YouTube channel used to showcase their products and technology. From videos on the manufacturing of Kohler Generators to the importance of backup power generators for both homes and businesses, there are several reasons for users to view the Kohler YouTube channel. Audiences can find value in Kohler videos for a multitude of reasons – perhaps they want to see a step-by-step guided process or learn how to undertake a task. Some videos can help teach processes, while other videos may show future technology and upcoming product releases, providing sneak previews of next generation innovations. Photos of Philips lights and lamps used for illuminating the exterior of buildings around the world are displayed on Twitter. Philips’ Twitter account shares colorful lighting photos that showcase the latest innovations from the lighting industry. 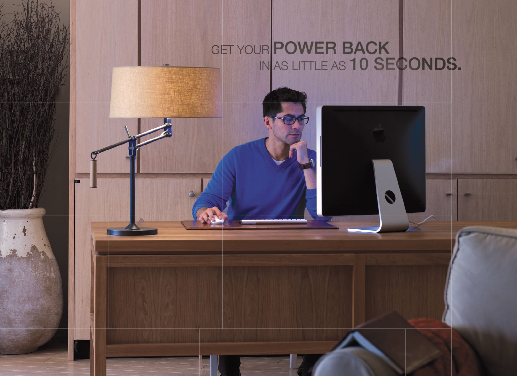 Philips also shares articles from magazines, promoting stories that feature Philips products and services. Sharing these publications gives Philips positive recognition from third-party trusted sources. 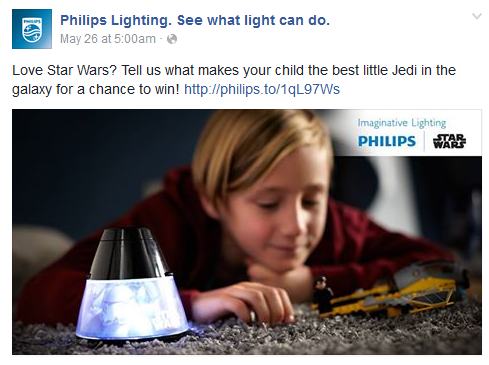 Philips Lighting’s Facebook page contains contests, such as a chance to win Philips and Star Wars lights by simply telling them what makes your child a Star Wars fan. 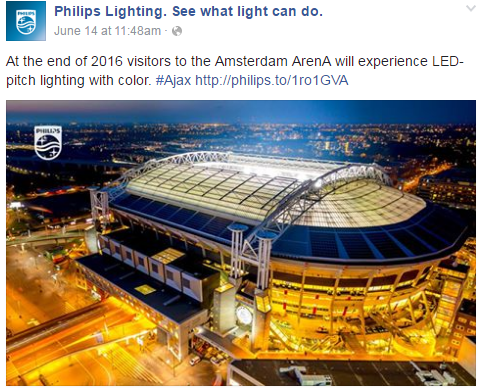 Philips also shares images of LED lights in use, such as in the Amsterdam Arena. Similar to Kohler, Philips utilizes current events to advantageously position their brand. With several videos, from “How To” demonstrations to featured products, there are numerous choices available for viewing on the Philips YouTube channel. The “How To” videos provide guidance, while the featured products showcase the range of innovative products that Philips Lighting offers. As a worldwide company Philips also localizes their videos by translating them into several languages catering to the copious local markets they serve, which means you’ll find many Philips videos offered in multiple languages. Philips additionally shares invitations for seminars and webinars through LinkedIn, encouraging more participation from readers and followers. The free seminars offer pertinent information on relevant and timely industry topics providing continuing education on practical applications of the latest trends. Posting a variety of useful and timely content on social media networks – from current event related information on community outreach initiatives – to featuring new products – to event invitations – to contests – provides information that is helpful and engaging to your target audience. Having customers continually return to engage with your brand underscores the importance of utilizing social media to capture mindshare that ultimately leads to market share. Additionally, another benefit of being active on social media is interaction – not only with customers but with other companies that are also present and active on social media. This allows for the potential of cross-promoting each other to audiences, sharing to each customer base, as well as creating the opportunity for building a working relationship between the two (or more) interacting companies. There are countless strategies and uses for social media that any company can benefit in, but even simply being active and maintaining a presence online (answering customer feedback or questions) is advantageous to any brand. In this digital age, more customers and prospective customers flock to the internet to learn more about a company, or to just find a brand for their particular interest or need, therefore it is absolutely essential to be ready and represented online. Be Prepared for Severe Weather with a Backup Generator! We are in bad weather season – from tornadoes and severe storms tearing across the Mid-West to hurricanes and tropical storms on the East Coast. The amount of times the power has gone out in areas in northern Illinois, Indiana and Southern Wisconsin is already too high to count. But, there’s an easy way to keep you and your family out of the dark in a storm. Why Do I Need a Backup Generator? Since 2012, one in every four homeowners has experienced a power outage lasting 12 hours or more, according to a recent Harris Interactive survey. Property damage averaged more than $1,900. Most homeowners don’t consider the need for a backup generator until they actually need one because the electricity has gone out. During the humid summer or frigid winter, we only recognize the weather issues when the A/C or Heater is down and we have no lights! But, at this point, it’s too late. There are an increasing number of homeowners as well as businesses that are considering or have already bought a backup generator. Most homeowners think a portable generator will do them good…and, in some situations, they do work just fine. This is an immediate solution to an emergency power outage that can run home essentials. Plus, you can bring it with you camping or to a tailgater! Standby generators, though, offer a more powerful solution when the electricity goes out…especially if it goes out for longer than a few hours. 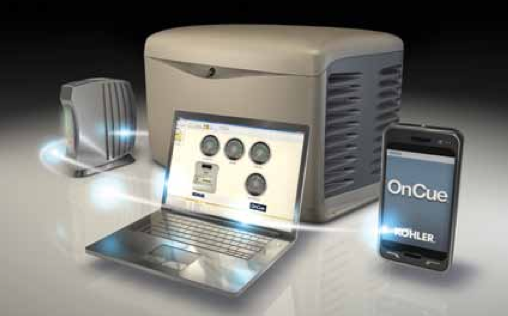 Standby generators automatically turn on when a power outage occurs. They are piece of mind for homes as well as business. We offer residential and commercial backup generators with clean power, quiet operation and a 5-year limited warranty. 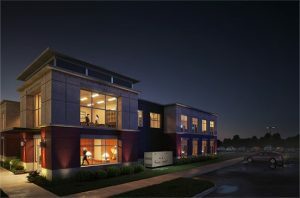 Isn’t it time to see how Steiner can keep your home or business powered when your neighbors aren’t?